WASHINGTON, Feb. 20, 2015 /Christian Newswire/ -- On Wednesday, February 25th at 7 PM in the Congressional Auditorium of the Capitol Visitors Center, Bishop E.W. Jackson will host a National Reconciliation Service entitled REKINDLE THE DREAM. "We cannot allow the future of our country to be mired in the politics of racial division," says the Bishop. "We need a new generation of spiritual and legislative leaders who will bring us together." Ministers from diverse backgrounds will be participating from across the country, including representatives from both Ferguson and New York, where incidents occurred which sparked racial unrest. The service was conceived as an alternative to the protests, riots and racial tension created over the deaths of Michael Brown in Ferguson and Eric Garner in Staten Island. Bishop Jackson wants to shift the focus away from protests to the long-term future of the country. "How long will America be a racial tinder box? How long will the racial history of the country be demagogued?" asks Mr. Jackson. "How long will businesses and communities be destroyed by riots? The service will bring together Pastors and Federal Legislators from across the country to reduce racial division and violence, create better relationships between police and communities, reduce crime and recidivism rates and through the combined power of the pulpit and legislation to foster peace and unity across racial and cultural lines. The ultimate goal of these services is taken from the Pledge of Allegiance: "one nation under God, indivisible with Liberty and justice for all." Participants will be asked to sign a "Covenant of Healing, Reconciliation and Awakening." Organizers intend this to be a model for communities to bring people together across racial and cultural lines. Local services are already being planned. Seating is free, but limited. Attendees must RSVP at rekindle@standamerica.us, or www.standamerica.us/rekindle-the-dream. 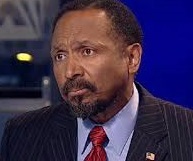 E.W Jackson is a Bishop of THE CALLED Church, a Marine Corps Veteran, 2013 Republican Nominee for Lt. Governor of Virginia and President of STAND. www.standamerica.us.